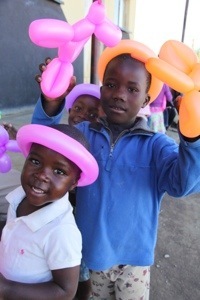 Today, we were able to see the vision of Pastor Mbongeni at work at the I Am Not Forgotten orphanage. It was a low key day filled with labors of love. 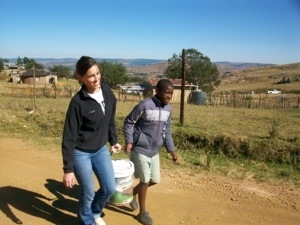 Our team had the pleasure of helping the 11 orphans and make (pronounced mah gay) Emily fetch water and firewood. Neither was an easy task. It was so humbling to see the lengths they have to go to each day for water and wood. The water did not flow in abundance today. In fact, the natural spring was so low and stagnant that they couldn’t use any of the water we collected for drinking, only bathing and cooking. The firewood team had to pass through a cemetery to get to the tree branches needed for the cooking structure. This is their everyday routine and I’m so glad our team was there to lend a hand and ease their load today. It was not all work. The kids took a while to warm up to us but after Lee broke the ice with his now infamous ballon animals, the party got started. There was lots of soccer, frisbee, dancing and crafts. The younger kids enjoyed the love and attention. 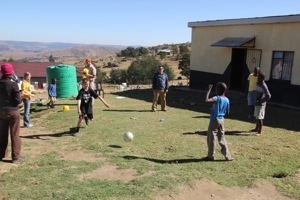 The older boys enjoyed being able to form a soccer team with people their own size. As our time there drew to a close, something beautiful happened. We formed a circle, held hands with the orphans and went to God in prayer. Standing on His mountaintop, the sun shining down on us, it seemed as if we couldn’t get any closer to Him. It’s one of the moments on this journey I will never forget. What a blessing. We can only imagine. you had a mountain top experience!! !